June 5, 2012 - Airmen and volunteers from the 19th Air Support Operations Squadron are currently taking a break from their primary mission of providing joint terminal attack controllers in support of deployed brigade combat teams to restore a historically significant plane. The team is restoring the World War II-era C-47 Skytrain with the tail number 42-100828, which was used in major airborne and glider-borne missions throughout Europe. "The Airmen usually serve as liaisons between the ground commander and the aircraft in conducting close-air support," said Lt. Col. J.P. Richards, the 19th ASOS commander. "This project is another in-garrison example of that same type of teamwork." U.S. Army Capt. James Page, the 101st Airborne Division historian with the Don F. Pratt Museum here, assisted with the historical and technical information, and the 19th ASOS team is providing the manpower. The work will take approximately 10 days with a total of 500 man-hours to restore the aircraft. The Airmen started with power washing the aircraft before moving onto the detail work of repainting the invasion stripes, stars and bars, and other historical markings. "We are starting with all the historical markings to be sure they are all in the right place when the project is completed," said Master Sgt. Scott McCoy, the first sergeant for the 19th ASOS, an aircraft structural maintainer and project lead for the 19th ASOS. "If we sanded everything off first, we couldn't ensure it would be accurate." Thankfully for the teams, the aircraft's history is well recorded. The C-47 was built in 1942 by the Douglas Aircraft Company in Long Beach, Calif., and was later assigned to the 92nd Troop Carrier Squadron, 439th Troop Carrier Group, 53rd Troop Carrier Wing, 9th Troop Carrier Command at Baer Field, Indianapolis, Ind. In February 1944, the aircraft was flown to Europe and initially stationed in Balderton, England. Eventually the aircraft was moved to Upottery, England. Aircraft 42-100828 participated in the invasion of Normandy on D-Day. The aircraft was part of a 45-plane serial and had the mission of dropping paratroopers from the 506th Parachute Infantry Regiment, now known as the 4th Brigade Combat Team, "Currahees," into Drop Zone "C" at J+30, roughly 1:15 a.m. June 6, 1944. The aircraft was later used in Operations Dragoon, Market-Garden and Varsity. The aircraft also dropped CG-4A gliders filled with medical supplies, fuel and ammunition to the 101st Airborne Division during the defense of Bastogne, Belgium, in December 1944. After World War II, the aircraft remained in Europe until the early 1990s, where it was stationed in France, Italy, Belgium and Germany with the U.S. Air Force. In November 1950, 42-100828 was transferred to Norway under the Mutual Defense Aid Program. In 1956, Norway transferred the plane to Denmark. The aircraft made its last flight with the Danish air force in July 1982, was taken out of service and placed in storage. 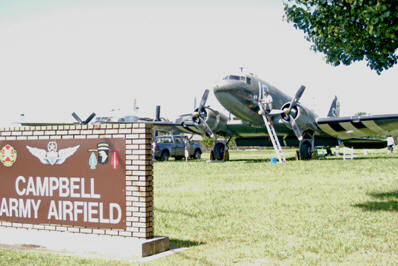 The aircraft was sold into civilian service in the early 1990s and flown to its final resting place at Fort Campbell where it was donated to the Don F. Pratt Memorial Museum. "Restoring this C-47 has been a huge success story, thanks to a team effort from the 19th ASOS and the 101st Airborne Division," said Col. Scott Kindsvater, the commander of the 93rd Air Ground Operations Wing, of which the 19th ASOS is a geographically separated unit. " They have preserved this World War II icon, an important piece of our common aviation history, to its full glory and at a very low cost compared to other aircraft restoration projects." Team members said they are honored to take part in restoring a piece of history. "I think it's awesome because one of my reasons for coming into the military, into the Air Force, was because I had a fascination with aircraft," said Tech. Sgt. Amanda Hall, a supply specialist with the 19th ASOS. "So, to get to restore a piece of heritage is really great."